A few weeks ago, my weekly meal plan got a little thrown off and I had mushrooms in my fridge that started to get a little close to the end of their shelf life. I literally had no idea what I wanted to do with them...I kept waiting for the lightbulb to go off...it didn't. After some internet research on whether or not freezing mushrooms was do-able, all that turned up was loads of mixed results. I was annoyed, and since it started to seem like they were just going to be thrown down the disposal in a couple of days I figured let's just try it. We tried a method that some say may make the mushrooms taste less "mushroomy". I figured that a less potent mushroom taste was a risk I was willing to take. 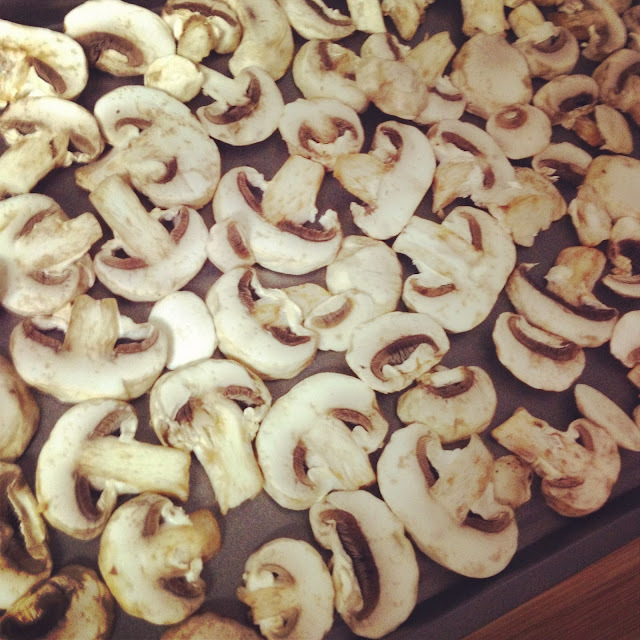 All I did was initially freeze the mushrooms laying flat on a baking sheet. After they were frozen, I threw them all into a tupperware, and then put the tupperware into a freezer bag. I'm not even sure that the freezer bag was necessary, but whatevs. When I was finally ready to use the mushrooms...they were fine! I didn't notice any lack of a "mushroomy" taste, so I guess that this is a food preservation win! Patting myself on the back for that one!